Magnet retention allows for most rapid access when needed. Flap adds additional security in a high-impact environment. Flap can be stowed to utilize magnet alone. Holds 2 pistol magazines secured with magnets and/or flaps. Mags are secure, but quickly available. Handles double and single stacked pistol mags. The outer layer is constructed from beefy 500 weight solution dyed Cordura®, fabric that improves and softens with time and wear. Very durable without being heavy. 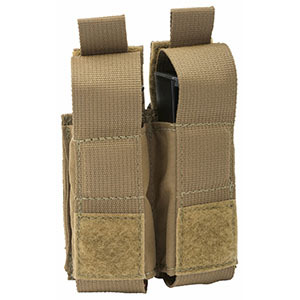 T3 Maritime MOLLE Closure System is included with every T3 Pouch. Compatible with all Molle/modular webbed systems. Reverse stitching is used wherever possible to enhance durability. Minimal use of binding tape. 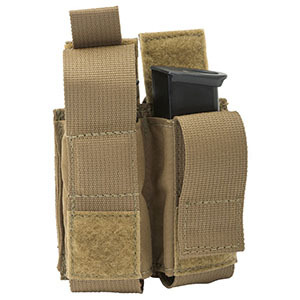 The Mag Pouch is available in 5 colors including Black, Coyote, Multicam, Desert Digital and Olive Drab. As with most high-quality items, T3 Gear gets better with age. As always it's the attention to detail that determines quality. T3 Gear is backed a limited lifetime warranty, is made in the USA and meant to be abused.